Many people choose destinations far away and grimace at the thought of passing through this bustling, nerve-wracking capital city. We are right there with everyone else, having overlooked this hub for all places Filipino. A wild city waits out there, but we’re regrettably bypassing it. I’ve seldom heard a positive thing said about Manila, yet am sad to be ignoring it again. The city is begging to be explored, but it won’t happen this time. This Manila travel guide is part of our series on Southeast Asia Travel. It was originally created on March 4, 2015. It has been maintained and updated (as of December 27, 2018) to reflect current viewpoints and travel trends. One still has to step out onto the ledge presented here, before moving on. Everything goes through Manila is an often whispered and remembered phrase throughout our time spent in the Philippines. Getting in and out of the city takes time, with current residents mentioning up to 8 hours that it can take from Manila to Boracay or one of the other known hot spots. My own dreams of the Philippines start with clear blue water and vibrant green spaces like we found in Bohol. Islands to hop to and places where you can get lost. You rarely ever hear of the hustling crazy hotspot where the action truly exists. Tourists seek one thing, while the pride of the Philippines lies hidden under a sea of colors, cold faces, and vrooming motorbikes. Knowing that this chaotic city is only a pit stop before moving on to our final destination in Bohol brings a brief smile to my face, as we taxi to the airport at 6 A.M. That bleary-eyed-haven’t-had-enough-coffee traveler wants to lay their head down during this quick commute, but little did I realize that in doing so I would miss all the hustle and bustle happening outside my window. 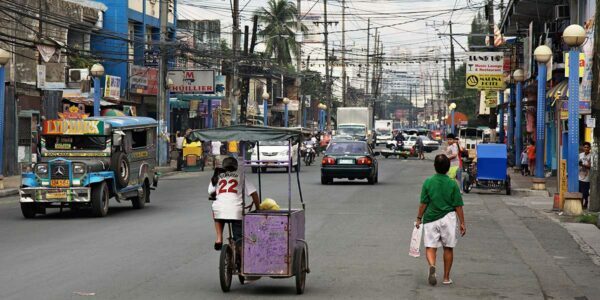 Gridlock never makes a city look good, and Manila’s has yet to rear its ugly head. The amount of traffic surrounding the airport at such an early hour indicates the peak hours will be maddening. Something interesting starts to come about. Traffic is usually akin to a boring record, but Manila’s tune awakens me from a brief slumber. A variety of colors moves furiously around our car as it weaves in and around others through a roundabout. A procession of motorbikes zooms through cleverly decorated tricycles and jeepneys. Traffic is traffic, but it’s more interesting in Manila. Seeing these intersecting colors and shapes make me want to ask the driver to turn away from the airport and go back into the city. The voice inside keeps me quiet. We have to board that plane, remember? Even as I sit on the plane that will take us to a place with more appealing green spaces and natural beauty, Manila stays on my mind. I read a friend’s words about the city I’ve just left, its unbelievably accessible streets and points of interest—about it being Better than Vietnam. A bold statement to make, and I can’t stop thinking about it. The natural beauty found throughout Bohol keeps me centered and focused until the final day. An early morning flight back to Manila should be simple enough, but a delay pushes us dangerously close to missing our flight. The pilot on Flight #1 explains that it’s all thanks to a “V.I.P. shutting down the airport for 2 hours.” Even as he finishes the announcement that introduces a lineup of truly frustrating moments on this day, I can’t help but want more. Even upon returning to comparably quiet and cozy Korea, Manila is still there—running through my thoughts. I want to go back to the Philippines, but not just to another one of its fabulous destination islands. Unlike what many people before me have never said, I want to go back to Manila. There has to be something there, for us all. It’s a place truly overlooked, and I want to find what’s inside. It all started with that motley crew of colors, and now I want to find more beneath the city’s rough and unpolished surface. No, I have to go inside. There has to be more. Ever visited Manila? What’s to see inside the big city? What an honest post 🙂 I am currently residing in Korea and sadly, I am guilty of considering Manila only as a ‘pit-stop’ when recommending places to visit for my friends. I would love to read your future impressions once you’ve visited Manila again! I just had that feeling after leaving Manila that I should give it another chance. Of course this was before a pretty terrible experience going between the airports. I want to give it another shot, regardless! Btw, where do you live in Korea? Just for you though, I’ll explain right now. That photo on the Manila post was taken with my iPad, believe it or not. I generally like to take photos that way or with my GoPro Hero 3. My wife (the actual photog in the family) uses a Nikon D5100 with a 55mm lens. I’m looking to upgrade but with the way that mobile tech is improving, it might not be necessary. I completely sympathise with your thoughts there Duke. I have to say though, of all the cities I’ve visited across the world, Manilla is the one in which I felt the most vulnerable and the least safe. The veil between order and chaos was palpably threadbare! I def respect you for wanting to explore Manila, but I just couldn’t agree. What was supposed to be a 2 hour layover there ended up being 12 hours on the floor of an unbearable airport terminal that we didn’t even know was a $20 taxi away from the actual airport! The mid-day traffic was, as you say, unbearable, and in the time from one airport terminal to the next, my friend had her iPhone stolen. I hope you’re right and Manila has some wonderful secrets, but I still think I’ll pass. Bummer! I guess it’s not for everyone then, huh? I just like to get out there and see for myself, I suppose. Others have called me crazy as well. I’ve never been there and also always here about the worst things about that city. But after I went to Vietnam I felt that people are way too subjective when it comes to places and it’s better to see it for yourself. For example, my one friend loves Hanoi and I hated it. Couldn’t see what others were talking about. But I’d definitely would love to see the Philippines and Manila for myself. Thanks for the post. Thank you, Nico! I agree with you that sometimes people have negative opinions when they shouldn’t but if we all had the same ones, then life would certainly be boring! Anyway, I’m sorry to hear you didn’t like Hanoi. Did you happen to write about it? Feel free to link as a reply. I am originally from the Philippines and plan on going back. My trip back home this past Christmas was to Manila to spend time with my family. We spent 9 days there plan on going to do more touristy spots next time. I agree, you should try and go back to Manila and spend a few days there. It’s not as popular as Cebu or Borocay, but you will have a better understanding of the people and not just one side of the country. Here’s a detailed account of my visit if you are interested. Also, looking forward to reading about your adventures in Bohol! I’m thinking of heading there this fall after a couple weeks in Korea. You summed up my thoughts about Manila pretty well. I too heard not a single good thing about the city. And while I heeded the advice to get out ASAP, I found myself wondering what could be so bad. Before my flighy back to Taiwan, I did have some time to kill so I walked around for about an hour. I would summarize what I saw as controlled chaos. It was definitely interesting though, not the least of which was shotgun armed guards standing in front of bakeries and Burger Kings. Like you, I think I’d like to get a little bit more of a taste of what the city has to offer in the midst of the chaos. Great writing on thos one! Thank you Matt! I think you and I share that desire to get in there and really see places for what they are. I appreciate you stopping by and commenting. How’s the Taiwan life treating you? We would love to go back to the Philippines as well. We went on a whim last summer and it has been one of my favorite places we’ve been so far. We didn’t explore Manila as we too have been told that it is crowded, polluted, and just “skip it.” “Better than Vietnam” is quite the statement to make, so I would love to read/see more about this city! Hey Stephanie, thanks for stopping by! The “Better than Vietnam” part was in reference to the walkability of the place, though I don’t think the coffee and food go anywhere near approaching Vietnam. Still good stuff though! Ahh I see. Still haven’t been to either place, so I am no expert to say which is better! Hi Lindsay! Thanks for the comment. I’ve also been warned about Manila as well but have gained an interest that can’t be put down even after leaving and having a rough time when departing. It’s got me hooked! Have you been to the Philippines before?